NOT A BAD VIEW TO COME HOME TO! As it is 2 weeks today since we arrived, I thought it time to start the 2014/15 blog as it seems to have become expected of me and I know some of you will be wondering where it is? Others, please feel free to ignore as I feel it is going to be rather a family orientated domestic one this year. We arrived on a lovely sunny Sunday evening and quickly passed through airport protocol and were on our way to our apartment before 8.00pm. The family had come up to await our arrival and I rang from downstairs to ask Oli to come down to give a hand with the luggage. He was on his way he said but Jack had hidden his shoes! We waited a while but gave up and had just got ourselves and luggage aboard the lift, doors closed and about to ascend when we heard a distinctive little chatterbox passing in the adjacent lift. We quickly opened the doors again and caught up with them on the ground floor. Jack was very excited to see us and very willing to give kisses and cuddles which was lovely. Oli was still barefoot and a comprehensive search of the apartment turned up only 1 shoe. 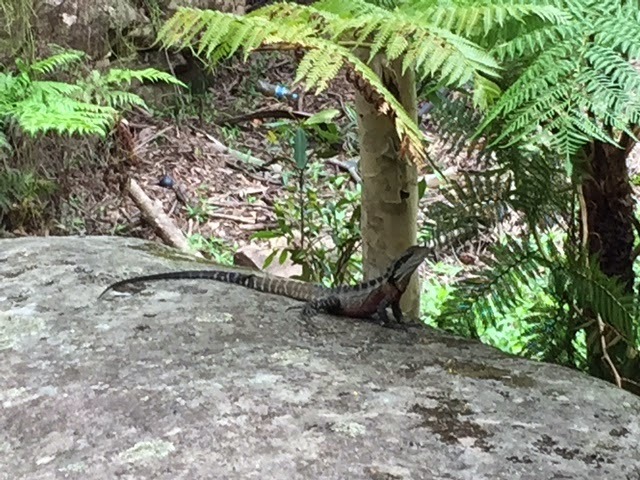 The only explanation is that the other one got “posted” out of our bedroom window and now resides in the inaccessible bush land 6 floors below! ALWAYS HAPPY AT THE PARK! After the family left, we spent a couple of hours unpacking and settling in and optimistically went to bed at about Midnight but managed no more than a couple of hours sleep. This set the tone for the week so we struggled through the jet lag over the next few days gradually progressing our morning cup of tea from 3.00am onwards. Unfortunately Jeremy compounded this with going down with the flu which seems to be rife back home and felt very unwell for about 5 days. In consequence, our first week in Sydney was rather slower than it usually is. I babysat Jack one afternoon taking him swimming and to the park whilst Angie went for her scan which showed everything to be progressing well with the pregnancy although the suggestion is that baby is quite small. She is looking and feeling very well although naturally anxious for everything to go well and hopefully, to term or nearly, rather than the somewhat traumatic early arrival of Jack. 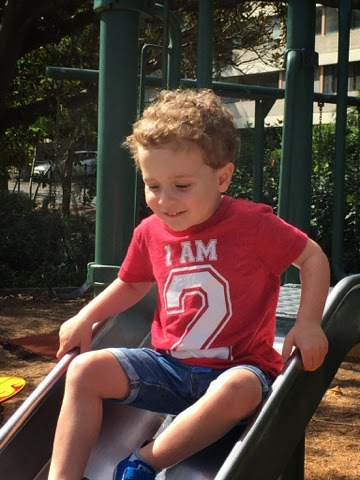 Any concerns for him re his development are completely gone though, he is an extremely bright active little boy with the best vocabulary of any two year old I have ever met. Still somewhat small in stature but I think that might come later if he is anything like his Daddy! On Christmas Eve, we took supper to Oli and Angie’s to give Jack the opportunity of an early night so that we did not end up with him overtired on Christmas Day. We then met up with them at the local Catholic Church on Christmas morning. We went to a different one from last year to suit our timing. This one was quite large and with a very friendly welcoming congregation. So much so that Jeremy and I were picked out and asked to take the offertory. I took this to mean the collection but it was to take the priest the bread and wine for the communion. The attendant asked me a little bit about myself and when the time came the priest announced that we had come all the way from the UK to bring the offertory. We took it up and hopefully did the right things curtsying and genuflecting then he had quite a chat with us before we returned to our seats and said he hoped he hadn’t embarrassed us. I was just hoping he had not sussed us as interloping Anglicans in his congregation! Anyway it was a lovely relaxed service and lots of people chatted to us outside afterwards. There were lots of family’s some of whom like Oli and Angie were popping in and out with their bored offspring. Jack had been promised that he would see baby Jesus and was loudly demanding as to when this would be! (Actually not so loudly but that’s what it seemed to Oli and Angie). After church, it was back to Oli and Angie’s for traditional Snowden Christmas brunch (Smoked salmon and scrambled eggs washed down with champagne) followed by valiantly tackling the massive pile of presents under the tree. 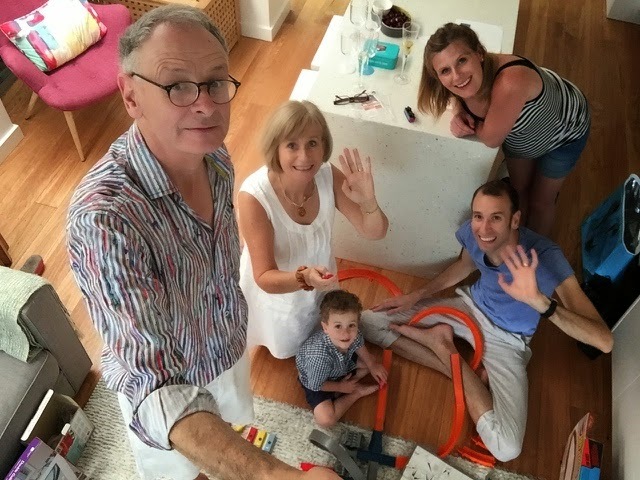 We then headed over to Ali and Marty’s house in Chatswood where Oli and Angie had undertaken to cook traditional Christmas lunch for us all including 5year old Ceci and 3 year old Frank. The turkey had been sent ahead along with instructions as to when to put him in their oven. After yet more champagne and yet more presents, Oli and Angie got to work in the kitchen and produced a lovely meal for us all. The usual happy over indulging Christmas Day! Since then, we have been working our way through the left over turkey in ever more inventive fashion and trying to get some exercise to counter its effects. 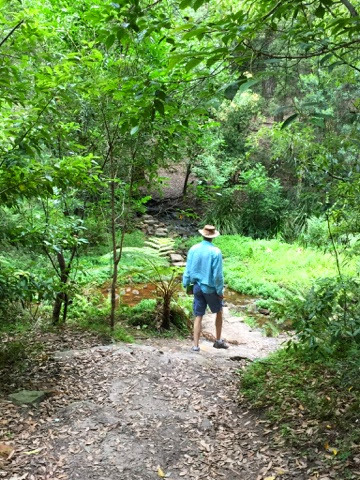 Jeremy and I had a lovely walk yesterday around Parramatta Lake. Very scenic as the path pretty much followed the water lily covered lake all the way round. Last night we went out to dinner for the first time since our arrival and today we plan our first trip to the beach. It seems we have acclimatised! 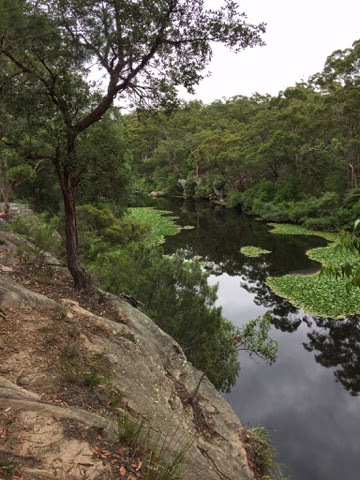 We look forward to the imminent arrival of friends Paul and Moyra and our joint trip to South Australia in a couple of weeks and meanwhile wish you all a Happy, Peaceful and Healthy New Year.